The three of us had a lot of fun last night giving a talk at Ashford Photographic Society. 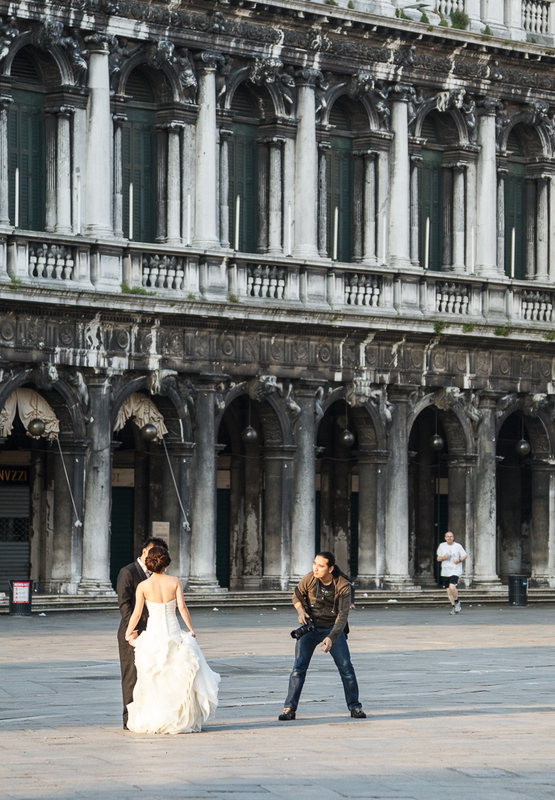 One of the sets of images I included was from a recent trip Julia and I made to Venice and, for those who missed out, here's a taste. 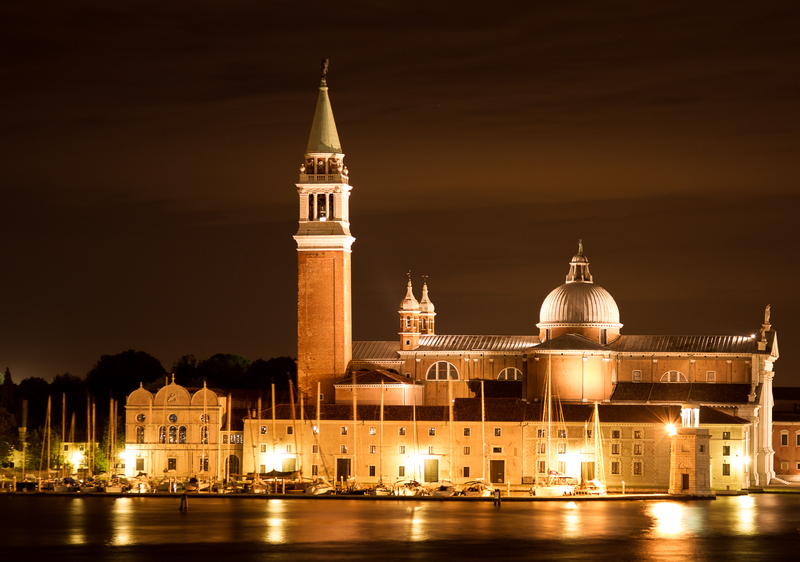 There aren't too many places one can go to in Europe for a whole week and not see a car; Venice is one such destination. 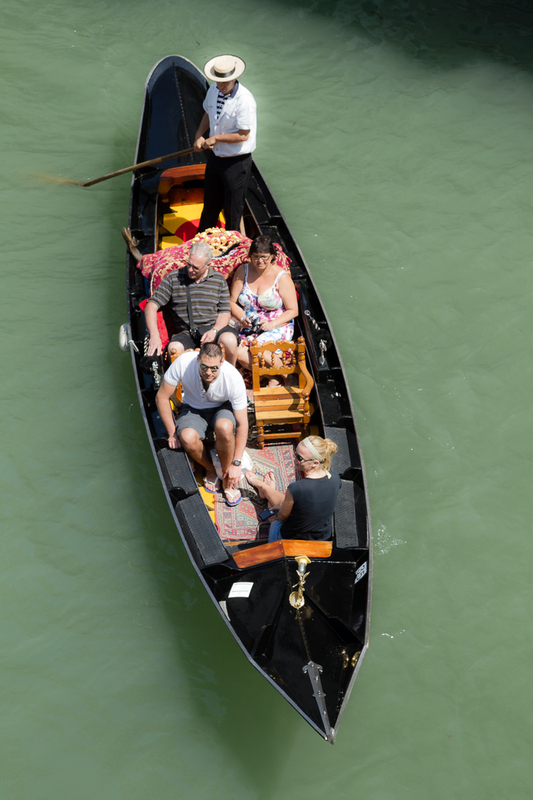 Every form of travel that is not made on foot is via the many waterways, on a variety of craft such as water taxi, water bus or gondola. 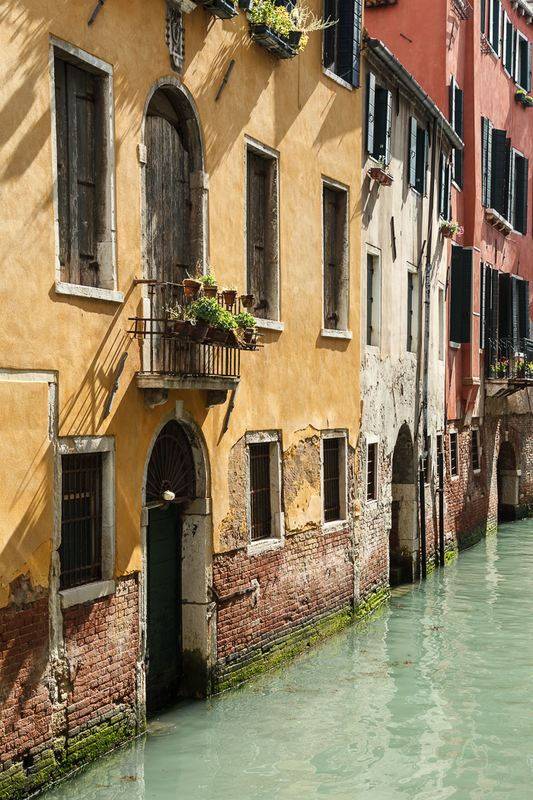 It's easy to forget that the city is home to working Venetians, so barges and other commercial craft can be seen maintaining business as usual. 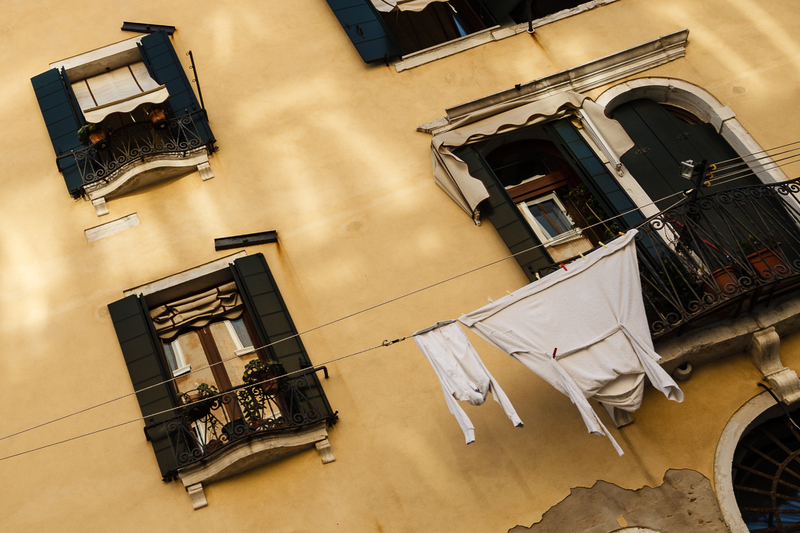 One can see clean laundry being delivered to the hotels in the mornings and 'water hearses' transporting dearly departed souls to their final places of rest. 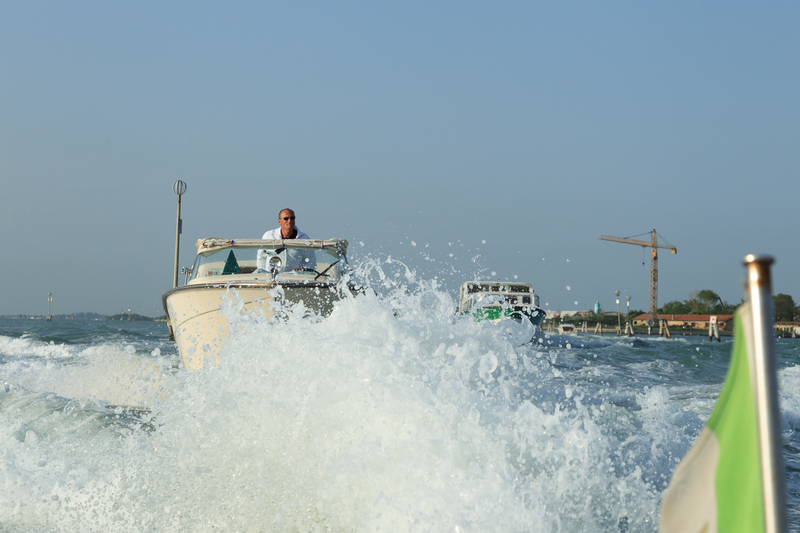 There are a number of ways of getting from the airport to your hotel but the most efficient and exhilarating option is to take a water taxi. 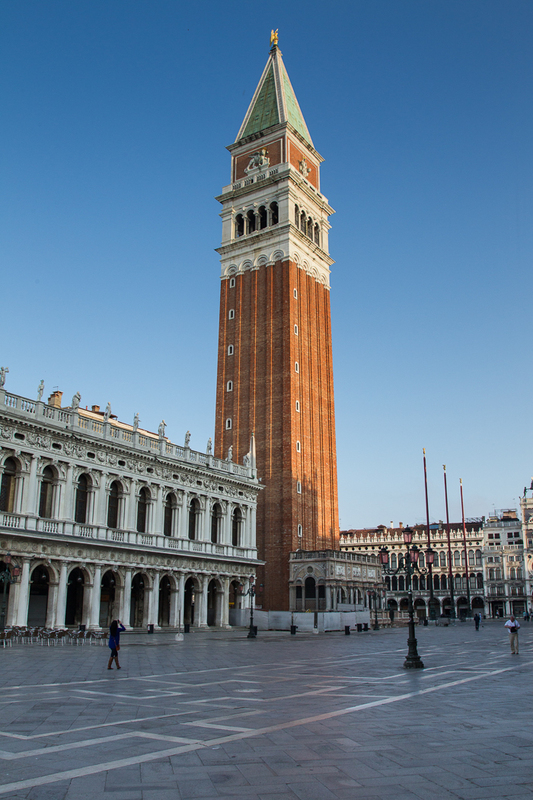 We pre-booked one about a week before with a company called Venicelink and within 10 minutes of leaving the arrivals lounge we were on our way. Taxi drivers are the same the world over, and it wasn't long until we were out into open water, racing with the other taxis. 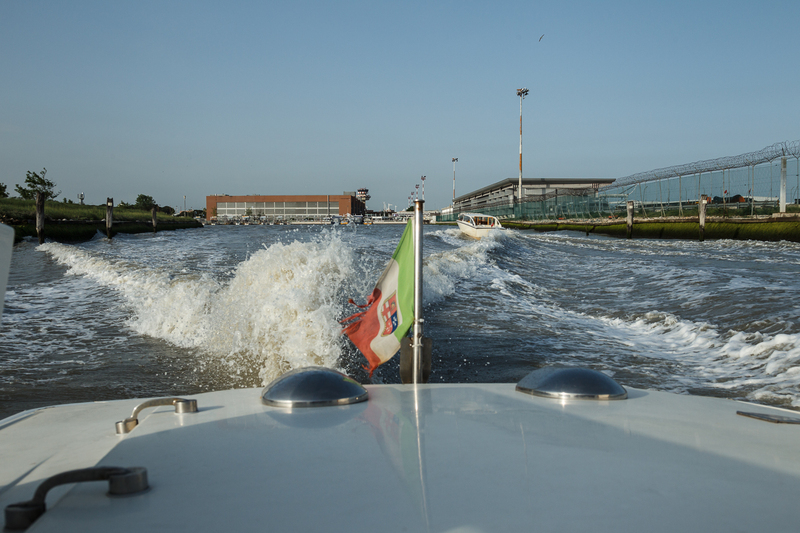 Only when we were within about 500m of the city did were the engine revs cut and we were sedately navigated to the San Zaccaria taxi mooring, about 100m from our hotel, the Locanda Vivaldi. 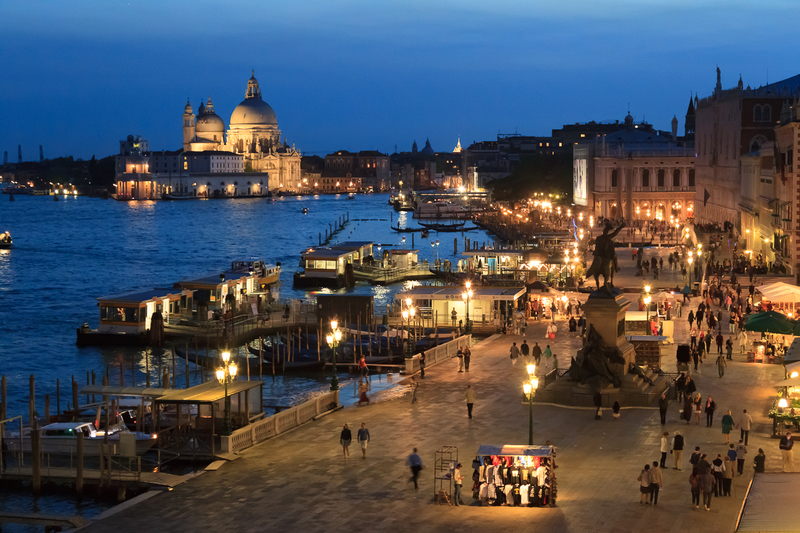 The hotel has a terrace restaurant on the top floor, offering stunning views up towards the Grand Canal and the San Giorgio Maggiore. If, like me, you don't like crowds then avoid the main square during busy times of day - essentially 8.30 am onwards - although, it does get a bit quieter in the evenings. The image below was taken just after sunrise. The highlight of the holiday was to walk out in the evening into one of the many backstreets to discover those tucked-away bars and restaurants - the hidden gems of the city. 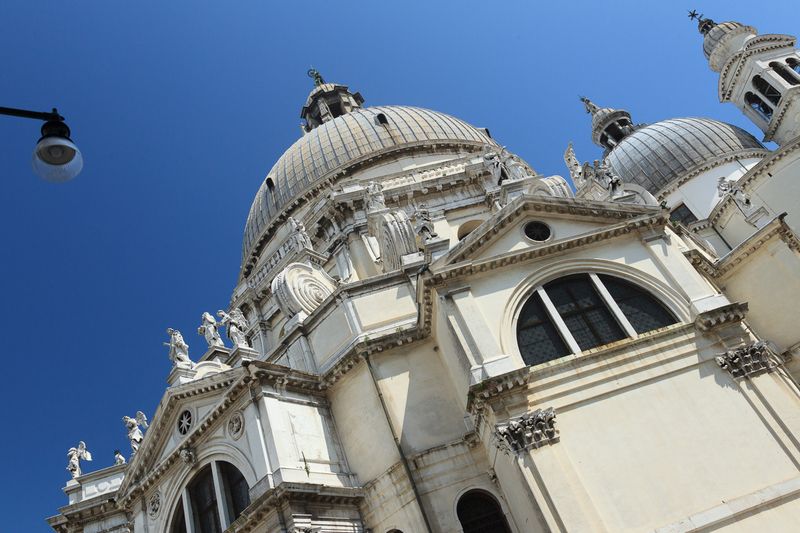 And, in comparison to St Mark's, the smaller squares were much quieter and frequented by families and tourists alike. 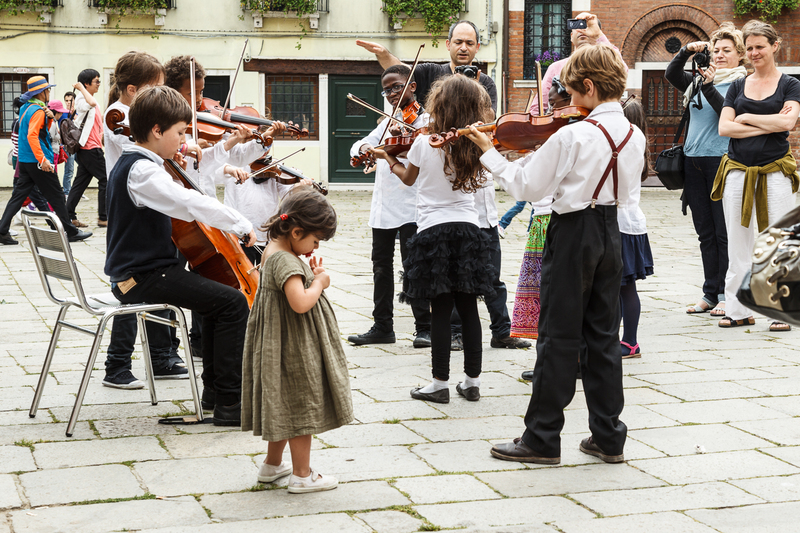 Late one afternoon, we sat in one of the small squares enjoying a cool beer when an impromptu 'concert' broke out before our very eyes. 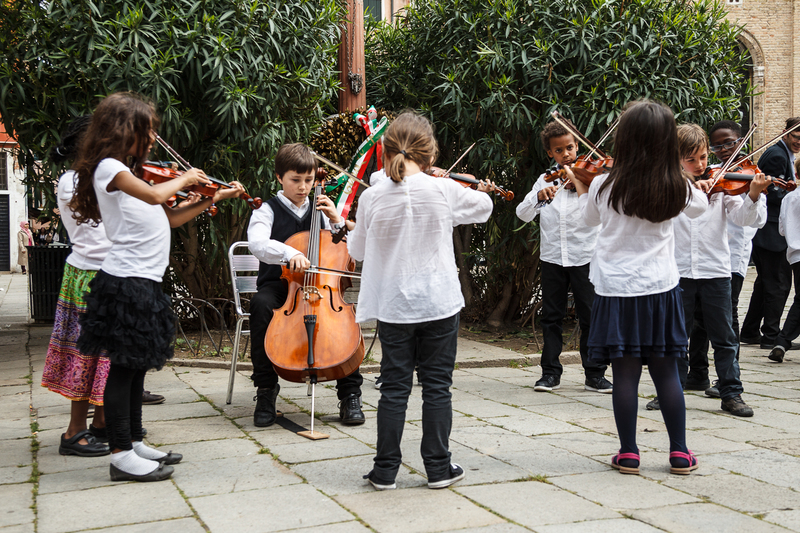 A group of young French children held a musical rehearsal. 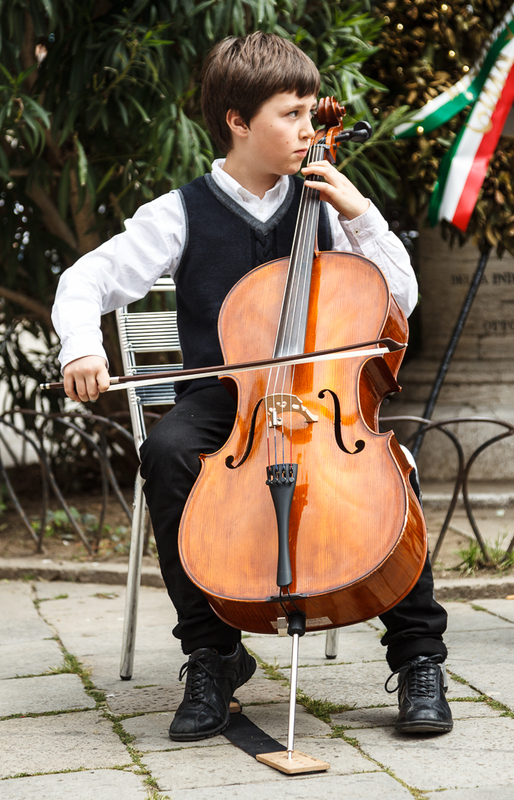 A virtuoso in the making? 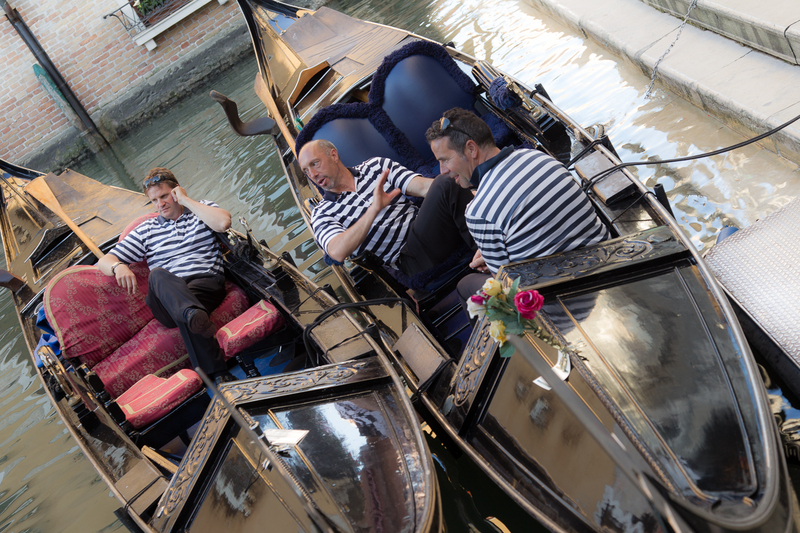 No photo blog of Venice would be complete without a few photos of the gondoliers. 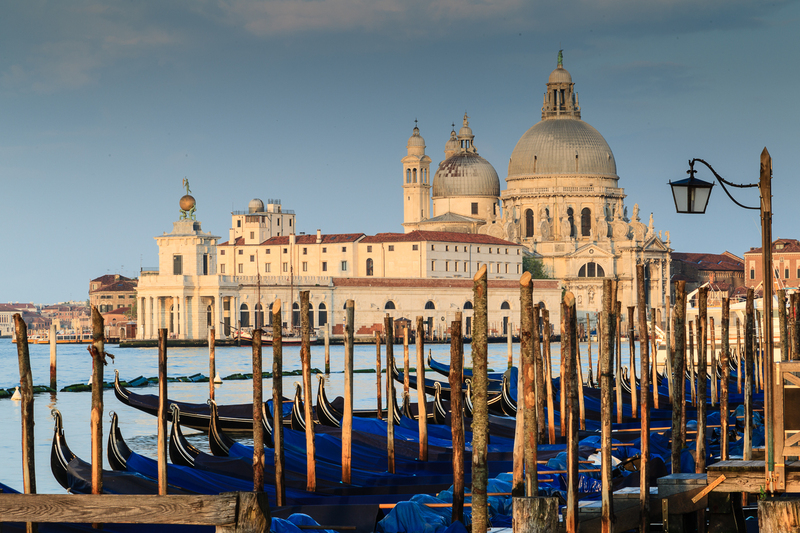 If you can force yourself to get up early there is a whole different Venice waiting to be captured. The shot below below was taken at 5am, just up from our hotel looking out across the lagoon. 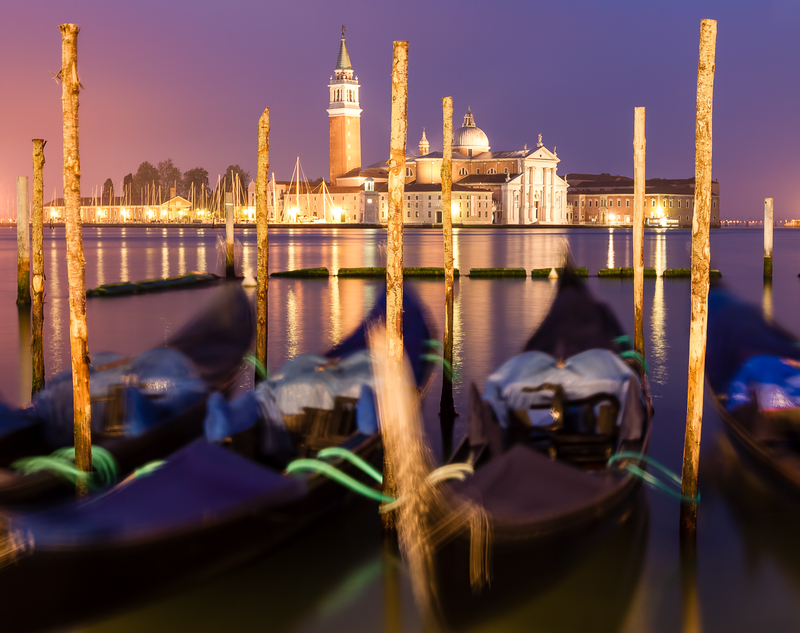 There is a mixture of lighting: The sun is rising from the left, the San Giorgio Maggiore is floodlit and the street lights are illuminating the gondolas and posts in the foreground. 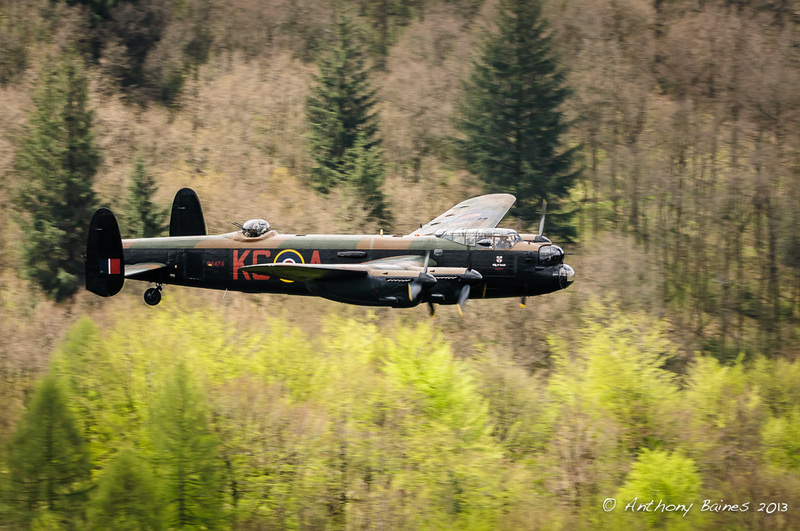 Last Thursday (16 May 2013) marked the 70th anniversary of the famous Dambusters raid on the Ruhr dams by 617 Squadron using bouncing bombs designed by Barnes Wallis. Operation Chastise has become famous in years since (not least because of the film "The Dam Busters" based on the book by Paul Brickhill*). The 70th anniversary represents probably the last time to get the few remaining surviving aircrew together for the commemoration. As such, it has become quite an event in the media this year, and the Battle of Britain Memorial Flight seems to have been working especially hard with events and fly pasts throughout the country. 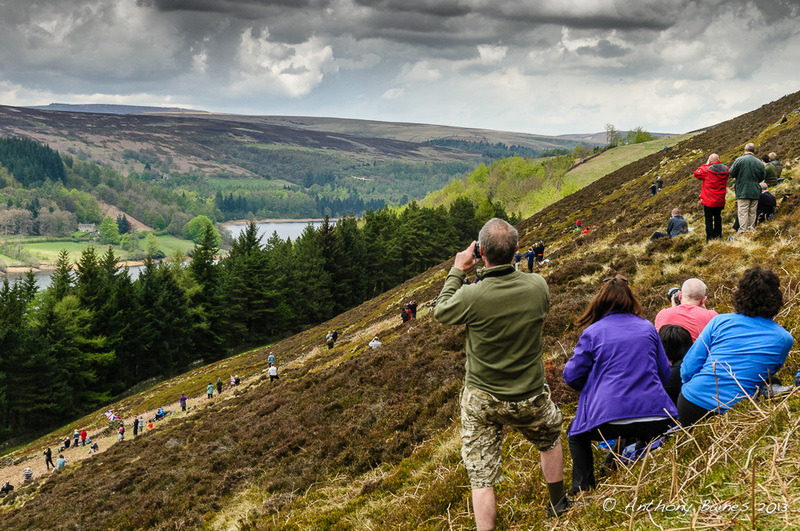 I discovered last weekend that there was going to be an event at the Derwent Reservoir dam in the Peak District. 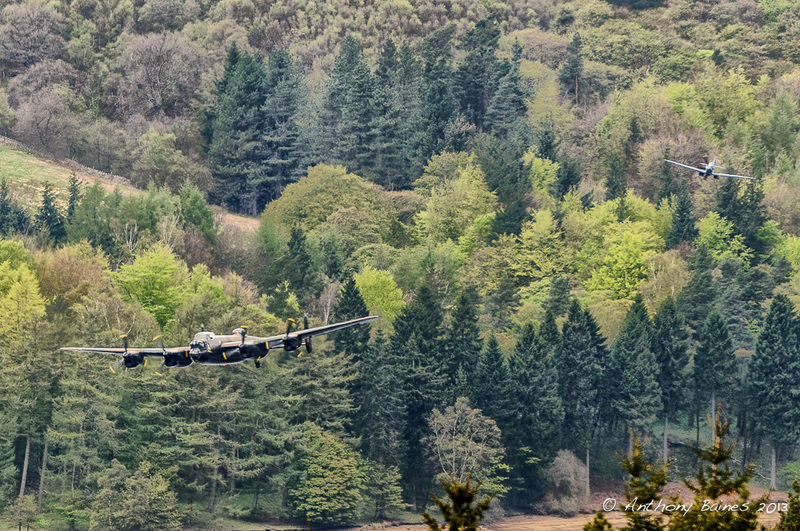 The BBMF was planning to fly the Lancaster and a Spitfire down the reservoir to mark the fact that the Derwent Dam was used to practice the raid. 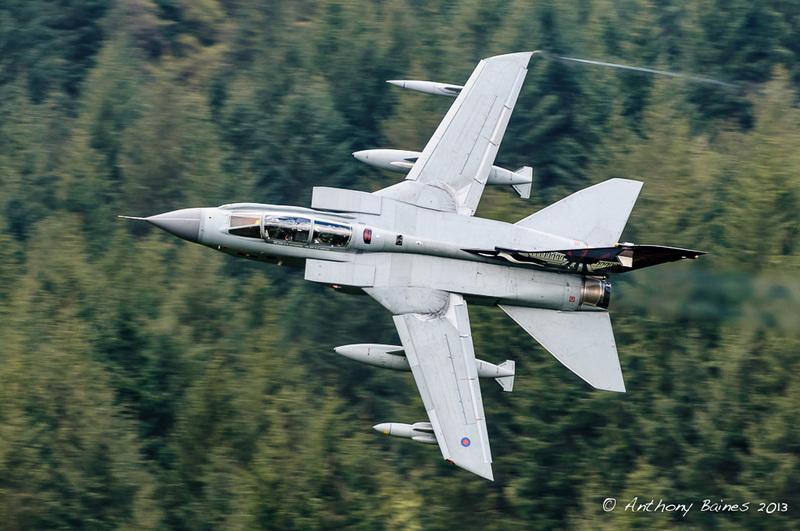 They were to be followed by two of the current aircraft from 617 Squadron, Tornado GR4s. That was an experience I could not possibly miss, and so I booked the day off work and headed for Derbyshire. I had read online that it was likely to be busy there and that car parking was extremely limited. 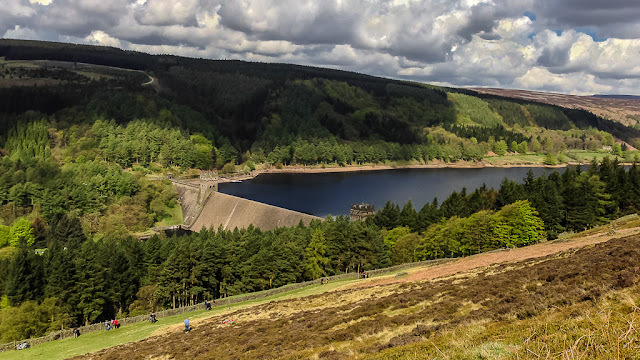 I could see a spot on Google maps where I wanted to get to on a hill overlooking the dam, so I thought I would try and get there early so as to get up the hill in time to secure a reasonable place. I arrived in the vicinity at about 8 o'clock to find that parking spaces were already at a premium. I managed to find the last parking space in a small car park about 2 km from the dam; there was a nice easy path along the lower reservoir up to the dam, so I had a most pleasant stroll along in the morning sunshine. Once at the dam, I made my way up the hill on the east side to the spot that I’d picked out. It was a bit of a slog uphill across the heather, but by 10 o'clock I had found my place. There were hundreds of others there already on that patch of hill, but I found a good vantage point that gave me the view I’d pre-visualised. I had been dreading low cloud and rain, but luck held and they kept away. There was just a bit of broken cloud and no rain at all. Very little wind as well, so providing the Lancaster did not go tech, we could hope for a great display. More and more people kept on arriving during the morning. I could see even from the hill that the double yellow lines were fully occupied by cars, and it looked as though parking restrictions had perforce been suspended to the day. Large numbers of people arrived by bike as well -- I could see streams of bikes from my position on the hill on the road across the other side, and a few people even carried them up the hill! On the hill: spectators and their cameras. Given that aircraft were involved, the Y chromosome syndrome had clearly kicked in -- most of the spectators were men. Nevertheless there were a number of families with children, and just up to my right was a party containing mostly youngish women who seem to be having a great time. There were even two large Union Jacks planted halfway up the hill carried there by spectators. 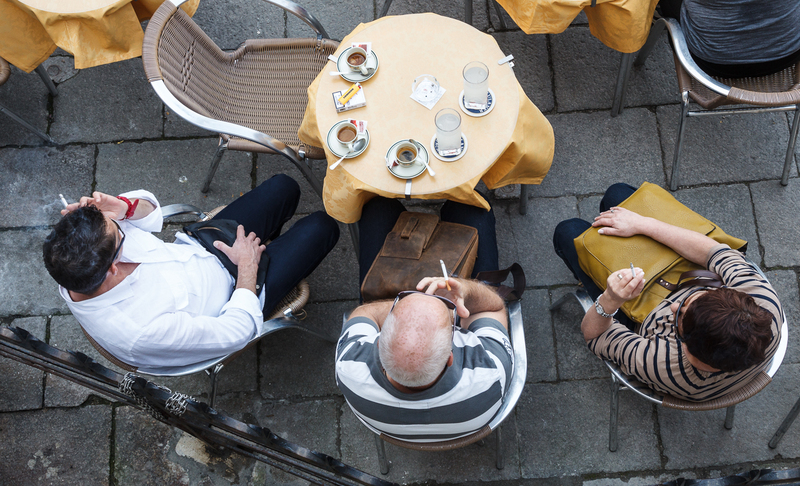 Something I enjoyed was just how sociable people were (yes, us miserable Southerners really are less sociable than those from Yorkshire and Derbyshire!) I chatted to various people on the way up and once I arrived, people around me were very happy to chat. There was a really good atmosphere; everyone was excited, as well as respectful, about what would unfold at 1 o'clock. The guy next to me had treated himself to a new Nikon D600 and a 70-210 VRII that he wanted to try out. His email address starts with Kojak - he is as hairy as the eponymous detective. I had the fact that I had picked a good spot confirmed when a smudger from Getty Images turned up next to me: those guys tend to know their stuff. He has a pair of 1DX bodies and a variety of lenses that included one of the new 200-400 lenses that he'd been using in prototype for six months (coincidentally, the e-mail from Park Cameras had arrived the day before relaying the announcement of this camera at an opening price of 12 grand.) Wonderful lens was his verdict. Periodically, I checked my camera. All that waiting was making me paranoid that when the Lancaster came and I got my only chance for a shot at have the camera set wrong and miss it. The point of the day was to get a picture of Lancaster actually over the dam, with the whole dam in the picture. I had not known which lens to bring to this, but fortunately I had brought my old 18-70 with the D300, and that allowed me to frame the scene exactly as I had visualised. 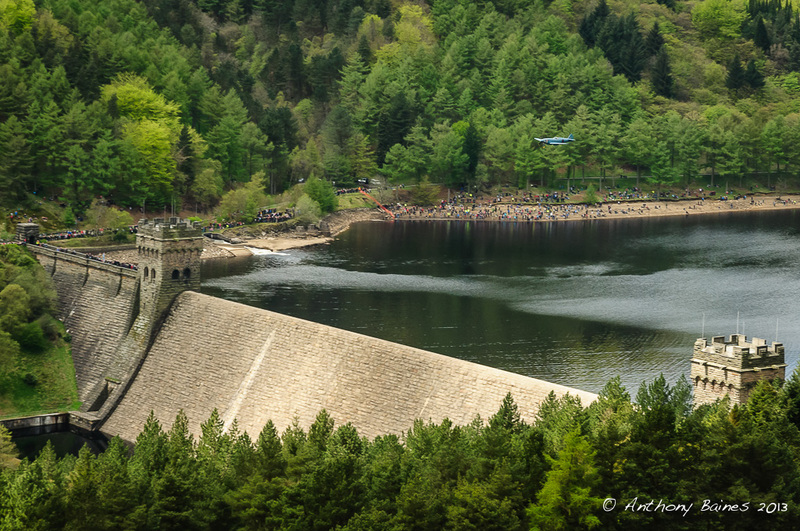 I had the big telephoto zoom as well, and my idea was to get the various aircraft as they went over the dam with the 18-70 and then, if there was enough time between the aircraft runs, to swap on the tele zoom for some close-ups later. Check, check, check -- I think I must have used up much of my battery checking that I had enough charge on the battery, as well as all my settings -- shutter set to CH (continuous high), no exposure compensation needed, AF-C and so on. The big dilemma was about the choice of ISO and shutter speed. The light kept coming and going and eventually I settled on ISO 400. Shutter speed -- the thing is to keep evidence of prop movement, but the longer the shutter speed the more chance there is of blurring the plane. The other thing is that I wanted to show context, i.e. the dam had to be reasonably sharp and not simply a mass of motion blur. I started off on shutter priority at 1/250, with the plan to go to 1/320 when I swapped on the big lens. Generally, if I can, I'll go to something like 1/160 for the Lancaster, but today the priority was just make damn sure I got something sharp! I also set Aperture Priority mode for wide open, so that when the Tornadoes came through I could switch to A at full aperture to get a fast shutter speed. At about 11:30 strains of a brass band began to waft across from the other side of the dam. I could also see a parade of some sort on the dam itself. I never did find out what it was, but "Onward Christian Soldiers" and "Abide With Me" followed by "The Last Post" must give an indication. The first sign that something was on came with a pair of media helicopters arriving about an hour after that. They went out to a holding position out to the west of the dam. Everyone was sure that the BBMF must be on their way -- nobody could read tweets (no service on mobiles there) and there was nobody with a scanner around so I couldn't follow any progress. But promptly at about two minutes before the scheduled time of their run over the dam the distant shape of Lancaster appeared over the far hill. Unfortunately, its four Merlins were drowned out by the helicopters. I could see a blue Spitfire as well -- it had to be a PR Spitfire, very appropriate as one had brought back the famous pictures of the breached Mohne and Eder dams. At exactly 1 o'clock we could see the BBMF PRXIX approaching, making a fast run down the reservoir. As it approached the dam, I was surrounded by the noise of clicking shutters. 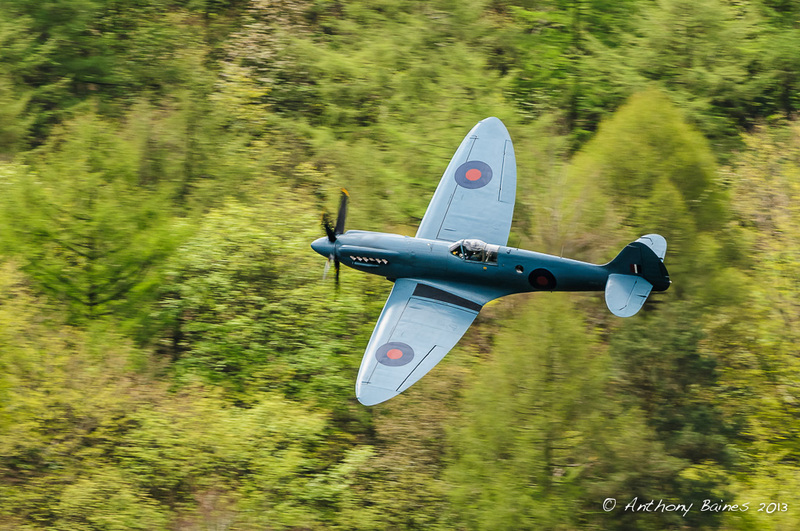 The 1DX next to me chattered away fastest and longest, while Kojak next to me began to curse his new Nikon D600: he'd hit the buffer before he’d expected and his camera had simply stopped taking any more pictures as the Spitfire crossed the dam. The D300 worked perfectly and never stopped, so if the pictures were no good it would be my fault not the camera’s. The repair to it was paying for itself again. The only thing was that the Spitfire looked ever so small in my viewfinder, emphasising the relative scale of the dam and the aircraft. 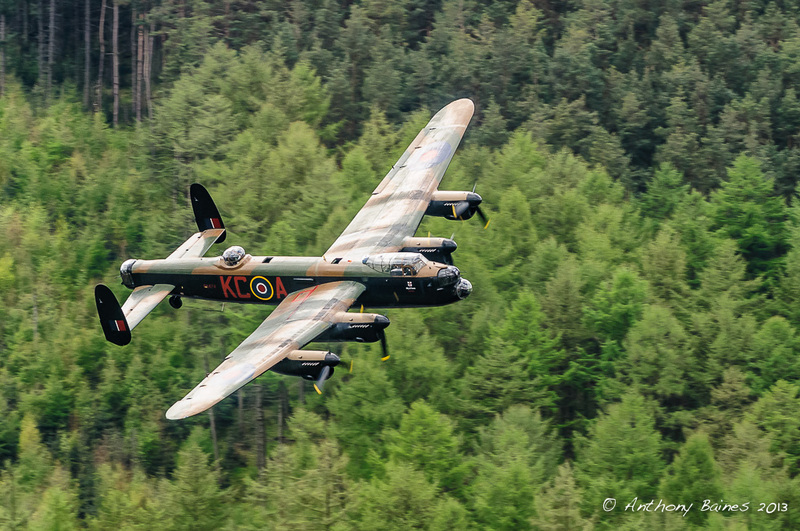 Soon after, the Lanc commenced its first run down the reservoir. Everyone stood up and cheered. I'm not sure of the height it was flying above the reservoir (400 feet? ), but certainly higher than the 60 feet of the original raid. No matter as far as I was concerned -- it was there, and if it is being flown prudently that's good, because I'm hoping that my (still hypothetical!) grandchildren will also get to see it fly one-day. I got the shot I’d come for -- the Lancaster over the dam. I'm not sure whether Kojak did -- he was cursing the D600 again. Getty man seemed happy. I quickly came to the conclusion, chimping on the back of D300, that now that I had the shot I was here for, there was really no future in keeping the 18-70 on the camera. One picture of a tiny aircraft against the dam was enough: the opening picture shows this. Aviation geek took over, which means mucho telephoto. As a result, I already had the big lens on when the Tornadoes made their run -- in retrospect, it would have been nice to have a picture of the two of them over the dam, but I'll settle for the close-ups anyhow. In the rush, I forgot to change shutter speed, and kept it on 1/320. My experience has always been that panning fast jets at 400 mm with a comparatively slow shutter speed like 1/320 is a low yield procedure. 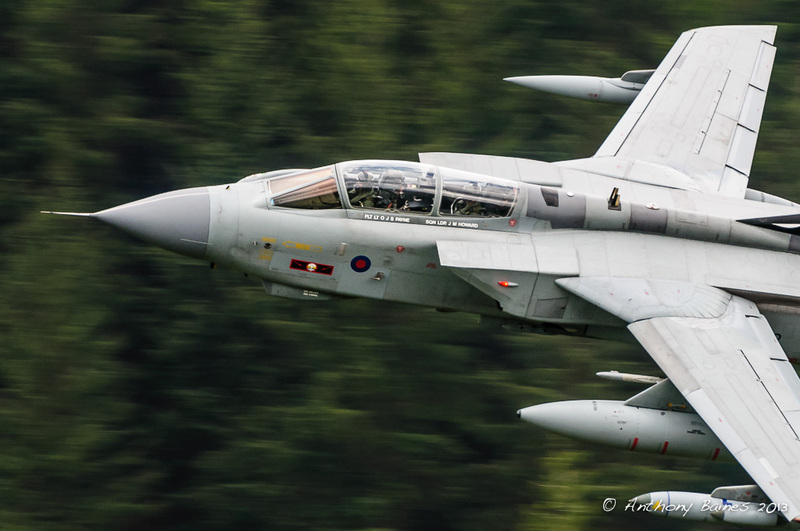 These Tornadoes were going to provide me with my first views of fast jets below me against a background, so I would happily take minimal background blur in exchange the sharp pictures. I managed to keep up with the Tornadoes anyhow, and enough of the pictures turned out just fine in any case. In the end, the Lancaster made three runs; down the reservoir, around and back up in the opposite direction, and then down again. The tornadoes also made three runs. The Spitfire followed the Lancaster on his last run down the reservoir, and because I was concentrating on the main attraction, I only got the Spitfire as it retreated. Nevertheless, a pleasing shot. The Lanc runs down Derwent Reservoir, followed by the Spitfire. And then it was over. A 400 mile round trip and three hours sitting out on hillside for about 15 minutes flying. Bargain. Best value of the year. I think in the end, everyone was very moved. Seeing the Lancaster actually flying over that dam brings home just what an extraordinary achievement Operation Chastise really was. This blog piece is already well into TLDR** territory, so I won't go any further with that thought except to say ... I'm very grateful, thank you. Coming down the hill, there was one lovely moment. A young woman with vivid (almost fluorescent) red hair was talking to someone. "You photographers are indeed strange people. I'm going to tweet that when I get back to civilisation." Strange people? Can't argue with that. *If you are at all interested in the Dam Busters or 617 Squadron, I do recommend the Brickhill book. Still available in paperback. I know that it has been criticised for presenting an idealised version of events, but it is still staggering, not least in recounting the operations of 617 after Gibson. In any case, Guy Gibson's book "Enemy Coast Ahead" is also essential reading. Update 4 June 2013. 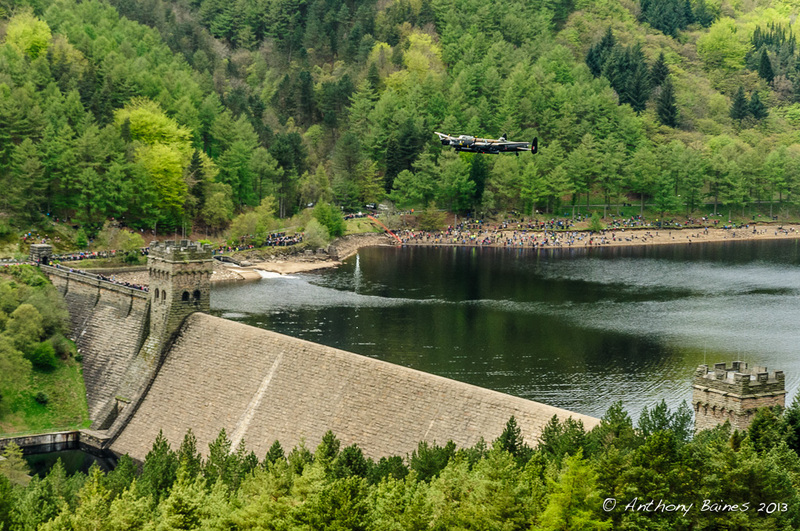 The opening picture shown the Lanc over the Dam has been chosen as a UK Airshow Review Picture of the Week for Week 20, May 2013. What would I want in a Photoshop replacement? I'm sure that readers of Wonky Horizons will have seen elsewhere the sound and fury generated by Adobe's decision to turn Photoshop into a subscription-based service, and to drop the boxed product. Without going into the whys and wherefores, I'm sure that many photographers will either (A) take advantage of relatively moderate pricing to keep fully updated with the latest versions or (B) never update the last version of Photoshop CS-whatever they have bought. I have to say that I find the demand for yet another monthly subscription very unattractive, even if it is comparatively low cost, and the thought of never owning what you've paid for (even when you've spent more than the historic cost of the boxed product) equally unattractive. Apart from anything else there are diminishing returns with upgrades now in terms of new features that are "must have": Photoshop CS6 offered nothing I consider essential over CS5*. Just as new versions of Microsoft Office have offered nothing new that I really need for the better part of 10 years, so Photoshop is asymptotically approaching full maturity. And for most photographers in East Kent, their broadband connections are too slow to make best use of the cloud storage and sharing features anyhow, given that a multilayer PSD master file easily hits 200+ MB these days. There have been endless discussions about this out in inter-web land -- I think that (among others) Thom Hogan, Luminous Landscape and Drew Gardner have summed up the arguments very well. One consideration that affects my view of Photoshop is that many of the earlier functions that I would use CS3/4/5 Camera Raw for are now subsumed into Lightroom. At this point, I'm going to assume that, for the foreseeable future, Lightroom will remain as my raw converter of preference, and also as my first pass at getting a good developed image. I think I can also make the assumption that the current version of Photoshop will live on my computer for at least the next three years. So at least until the point in time where changes to the operating system etc. make the current version unworkable, I see no reason to buy into Photoshop CC. Given all this, perhaps in three years time, I'll be looking for a Photoshop alternative. This has prompted me to come up with a list of key items that I would want any such program to be able to do. 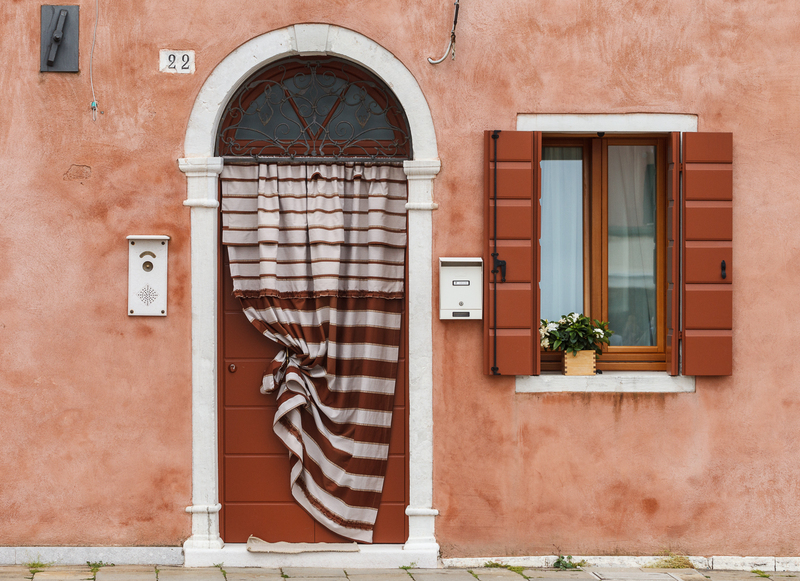 Raw conversion and the basics of producing a workable TIFF image for subsequent finishing, as well as file management are not an issue, simply because I'm assuming that Lightroom will continue to do that. These days, I use Photoshop for finishing images, or for making layouts for publication. So, in an ideal world, what would I like the Photoshop-replacement to cover? Here is a quick list of thoughts, in no particular order. -- Painting on layers and layer masks with user-definable brushes, changeable blending modes and opacities. -- Adjustment layers that can be clipped to another layer for curves, HSL etc. Further support for selections -- pen tool, rectangular and other shaped marquees etc. Convert path to selection. Modify selection (expand/contract/feather). Quick select tool-replacement would be brilliant, but that maybe too much to hope for. Clone tool - and ideally a healing tool. Simple drawing tools and text support. Filters: different people will have their preferences, but for me the irreducible minimum is Gaussian and surface blur, sharpen (e.g. unsharp mask), and high pass. Ability to save a multi-layer Master files**, and output to tiff, JPEG, PDF and PNG. Grid and guides would be helpful. Layer comps would be helpful, but not part of my irreducible minimum. I may add to this as time goes by, but at least these are items that I regard as the irreducible minimum. Anybody know of an alternative application that already does all this? You'll notice a bunch of stuff is missing from this: quite aside from the absence of Raw handling, I don't need HDR or panorama stitching support, since there are plenty of other alternatives, and I already have some of them. Bridge would not be required. I think dedicated B&W conversion is moot: Lightroom does it extremely well, and there are third party alternatives. The shadow/highlight tool is not required, and neither are puppet warp or liquify (I can see others disagreeing with me about liquify). No 3D either. I haven't put anything about plug-in support, although that would be desirable. In any case, now that Google has bought Nik software, I don't know whether my plug-ins will still run in the timeframe we are talking about. Nevertheless, even if the Photoshop-replacement program does not support Nik or Topaz plug-ins, as long as I can get to them via Lightroom, it is not a big deal to make multiple Tiffs that could then be combined using layers and layer masks. Likewise, if the quick select tool is not replaced, there are already third-party applications for extracting objects from a background (Topaz has one for instance). 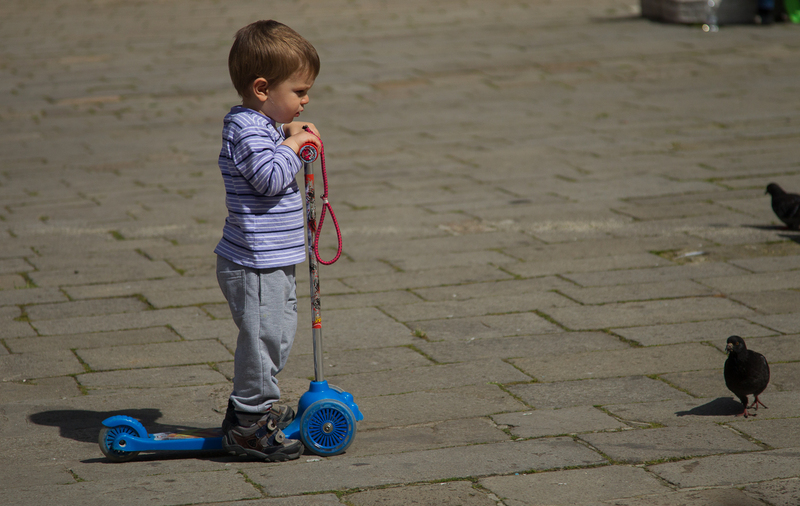 It is probably too much to hope that something like content-aware fill is replaced, but as with many of the things that Adobe are currently introducing into Photoshop (motion blur minimisation springs to mind), that is really about a rescue of a faulty image rather than tools to complete a great image. 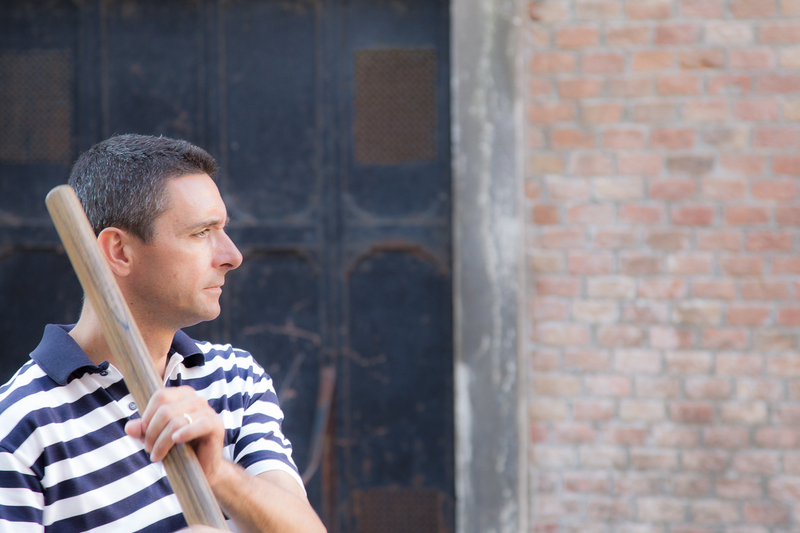 I'm happy to pay for tools to complete a great image; I'd rather avoid making faulty images in the first place. So, here is the challenge for developers. I reckon you've got three years or so to come up with something that will satisfy those comparatively impecunious photographers who do not wish to pay a monthly subscription, but who will be happy to pay a reasonable fee (let's say around the same price as Lightroom) for a great, compact, fast application that will replace many of the image-completing functions currently in Photoshop. In three years time (at the latest), the market really ought to begin to operate in this field. I guess the biggest fly in the ointment is going to be the extent to which the features I've listed above are bound up in patents. But I'm hopeful that something resembling my ideal will eventually appear as viable competition for Photoshop CC***. 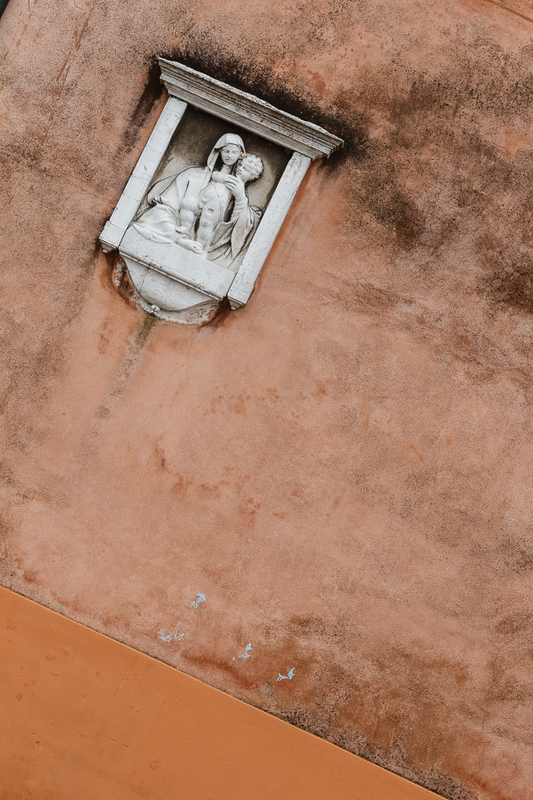 *The only thing about losing the connection between concurrent versions of Photoshop and Lightroom that I would miss is the ability for an image as a smart object in CS5/6 to be re-edited easily and non-destructively in Camera Raw. But, how much do I really use it? **It would be nice if it could read and edit my current PSDs, but I think that's too much to hope for. I'll content myself with using this programme for new work, and keep the old stuff as flattened Tiffs. *** As a final sub-point, I should point out that I'm not complaining about Adobe's decision to go to a subscription service, or even about their pricing. It is their product and they can do as they wish. This is simply a plea for some competition in the market. PS 15 May 2013. 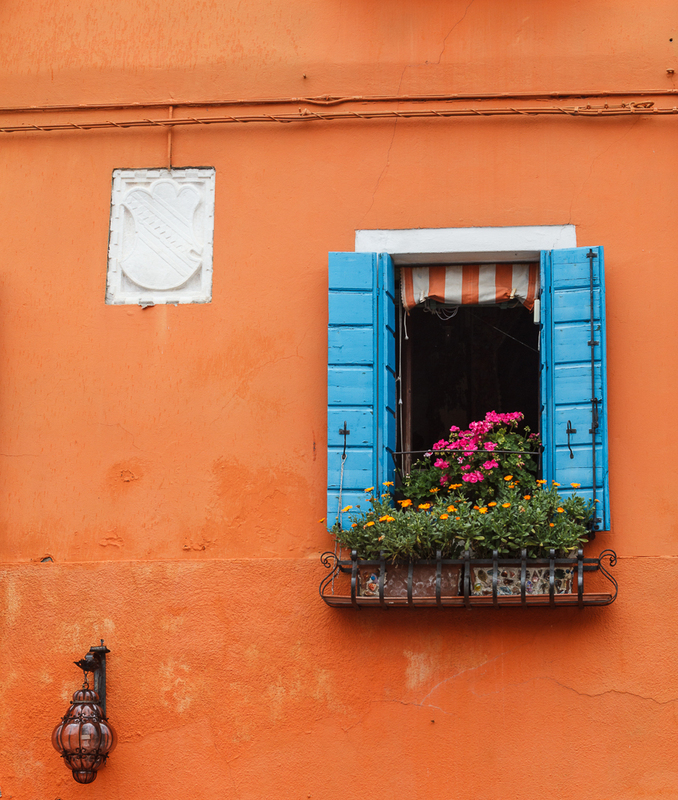 Thom Hogan points out the following: "Every--and I mean every--Adobe product user I've talked to or corresponded with has come to the same conclusion: "I need to reevaluate my product choices and my commitment to Adobe." Every last one." Count me among that number.